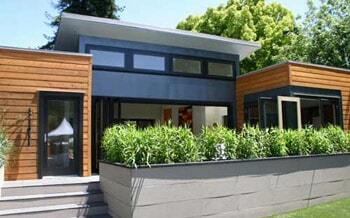 Building A Pre-Fab House Can Cut Construction Waste By 90%. I often contemplate buying land somewhere and building my own house. It would be real nice to raise kids somewhere that I have room to breathe and run around. I don’t know where or when, but that is my goal in life. I would like several acres to play with and grow my own food. Dreams are good, no? The house that I REALLY want to build is the Breezehouse, by Michelle Kaufmann Designs. I have been following Kaufmann’s projects for a few years, and even drove all the way to San Francisco one year to attend the Sunset festival just to see the model of one of her designs, the Glidehouse. While I fell in love with it immediately, my current favorite is the Breezehouse. Fully green, non-toxic and reasonably priced…check it out at the link above if you have a few minutes! Some of the biggest waste streams in traditional construction are packaging (up to 5%), timber (up to 25%) and plasterboard (up to 36%). Up to a 90% reduction can be achieved by reducing wastes such as wood pallets, shrink wrap, cardboard, plasterboard, timber, concrete, bricks and cement by increasing the use of off site manufacture and modern methods of construction. Count me in! Now when the time comes to build my dream house, not only will we be greening my own life, but I will be significantly cutting down the amount of waste my house would generate during construction. Score! David … the Breezehouse is awesome! I sent the link to my wife. I want one of those! Thanks so much for the link. I know, isn’t it fantastic? It has been our dream house for quite some time now and we hope to build one someday. Another one we have looked at is from the Office of Mobile Design. Either way, we hope to build eventually! Yeah, it’s amazing … but they don’t deliver to my area, apparently. Plus, it looks a little pricey for me, at this time. But I’m not ready to build yet, so maybe when I am, those two issues will work out. At any rate, it’s a lovely inspiration for my future house.